The lawyer for Christine Blasey Ford, the woman who has accused Supreme Court nominee Brett Kavanaugh of sexual assault, asked late Friday for an extra day to decide if she will testify next week. It was not immediately clear if the U.S. Senate Judiciary Committee will give Ford until Saturday to make her decision. Earlier, Senate Judiciary Committee Chairman Charles Grassley told the lawyers for Ford that the panel “has been extremely accommodating to your client” and wants to hear Ford’s testimony. 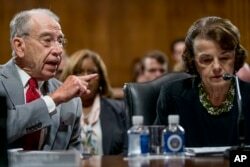 Senate Judiciary Committee Chairman Chuck Grassley, R-Iowa, left, accompanied by Sen. Dianne Feinstein, D-Calif., the ranking member (R), speaks during a Senate Judiciary Committee markup meeting on Capitol Hill, Sept. 13, 2018, in Washington. “I’m extending the deadline for response yet again to 10 o’clock this evening,” he said in the statement to Ford’s lawyers. Katz said her client has received death threats, and that Ford and her family had been forced out of their California home. Katz said Ford’s “strong preference” is that “a full investigation” be completed before she testifies. She had earlier called for the FBI to probe the charges against Kavanaugh. President Donald Trump speaks at a spending bill signing ceremony at VA Southern Nevada Healthcare System, Sept. 21, 2018, in Las Vegas. On Friday, U.S. President Donald Trump questioned the integrity of Ford, posting on Twitter that “if the attack ... was as bad as she says, charges would have been immediately filed” with police. Trump also accused “radical left wing politicians” of attacking Kavanaugh, who Ford said sexually assaulted her at a house party 36 years ago. ​Late Thursday, the White House released a letter from Kavanaugh to Grassley in which he said he wanted to tell his side in the Monday hearing. She alleged a “stumbling drunk” 17-year-old Kavanaugh sexually assaulted her at a Maryland house party in 1982 when both were in high school. She said Kavanaugh pinned her to a bed and groped her, putting his hand over her mouth when she tried to scream, before she managed to escape. “The reason that we know that this allegation is false is because we know Brett Kavanaugh,” Fagen said. Women who attended Holton-Arms High School in Bethesda, Maryland, with Ford signed a letter in support of her that was personally delivered Thursday to West Virginia Republican Senator and Holton-Arms alumna Shelley Moore Capito. Organizers said it was signed by more than 1,000 former students.